The Medes were an ancient Iranian people[N 2] who lived in Iran in an area known as Media and spoke a northwestern Iranian language referred to as the Median language. Their arrival to the region is associated with the first wave of Iranian tribes in the late second millennium BCE (the Bronze Age collapse) through the beginning of the first millennium BCE. In the 7th century BCE a unified Median state was formed which together with Babylonia, Lydia, and Egypt became one of the four major powers of the ancient Near East. An alliance with the Babylonians helped the Medes to capture Nineveh in 612 BCE which resulted in the collapse of the Neo-Assyrian Empire. The Medes were subsequently able to establish their Median kingdom (with Ecbatana as their royal centre) beyond their original homeland (central-western Iran) and had eventually a territory stretching roughly from northeastern Iran to the Halys River in Anatolia. The Median kingdom was conquered in 550 BCE by Cyrus the Great who established the next Iranian dynasty - the Achaemenid Empire. A few archaeological sites (discovered in the "Median triangle" in western Iran) and textual sources (from contemporary Assyrians and also Greeks in later centuries) provide a brief documentation of the history and culture of the Median state. These architectural sources, religions temples, and literary references show the importance of Median lasting contributions (such as the Safavid-Achaemenid-Median link of the tradition of "columned audience halls") to the Iranian culture. A number of words from the Median language are still in use and there are languages being geographically and comparatively traced to the northwestern Iranian language of Median. The Medes had an Ancient Iranian Religion (a form of pre-Zoroastrian Mazdaism or Mithra worshipping) with a priesthood named as "Magi". Later and during the reigns of last Median kings the reforms of Zarathustra spread in western Iran. Besides Ecbatana (modern Hamedan), the other cities existing in Media were Laodicea, modern Nahavand and the mound that was the largest city of the Medes, Rhages (also called Rey), on the outskirts of Shahr Rey, south of Tehran. The fourth city of Media was Apamea, near Ecbatana which its precise location is not known. In later periods, Medes and especially Mede soldiers are identified and portrayed prominently in ancient Persian archaeological sites such as Persepolis, where they are shown to have a major role and presence in the military of the Persian Empire's Achaemenid dynasty. Six Median tribes resided in Media proper, the triangle between of Ecbatana, Rhagae and Aspadana in todays central Iran, the area between Tehran, Isfahan and Hamadan. Of the Median tribes, the Magi resided in Rhaga,modern Tehran. It was a sort of sacred caste, which ministered to the spiritual needs of the Medes. The Paretaceni tribe resided in and around Aspadana, modern Isfahan,the Arizanti lived in and around Kashan and the Busae tribe lived in and around the future Median capital of Ecbatana, modern Hamadan. The Struchates and the Budii lived in villages in the Median triangle. The original population area of the Median people was western Iran and named after them as "Media". At the end of the 2nd millennium BCE the Median tribes arrived in the region (one of several Iranian tribes to do so) which they later called Media. These tribes expanded their control over larger areas subsequently and over a period of several hundred years the boundaries of Media moved. An early description of the territory of Media by the Assyrians dates from the end of 9th century until the beginning of the 7th century BCE. The southern border of Media, in that period, is named as the Elamite region of Simaski in present day Lorestan. From the west and northwest it was bounded by the Zagros mountains and from the east by Dast-e Kavir. The region of Media was known to the Assyrians and described by them thus: "extended along the Great Khorasan Road from just east of Harhar to Alwand, and probably beyond. It was limited on the north by Mannea, on the south by Ellipi." The location of Harhar is suggested to be "the central or eastern" Mahidasht in Kermanshah province. On the east and southeast of Media, as described by the Assyrians, another land with the name of "Patusarra" appears. This land was located near a mountain range which the Assyrians call "Bikni" and describe as "Lapis Lazuli Mountain". There are various opinion on the location of this mountain. Damavand of Tehran and Alvand of Hamadan are two proposed identifications of that location. This location is the most remote eastern area that the Assyrians knew or reached during their expansion until the beginning of 7th century BCE. In the sources from Achaemenid Iran and specifically from the inscription of Darius I (2.76, 77-78) the capital of Media is named as "Hamgmatana" in Old Persian (and as Elamite "Agmadana-", Babylonian "Agamtanu-", etc.). The classical authors transmitted this as Ecbatana. This site is the modern Hamadan province. The site is located 14 km west of Malayer n Hamadan province. The excavations started in 1967 with D. Stronach as the director. The remains of four main buildings in the site have "the central temple, the western temple, the fort, and the columned hall" which according to Stronach were likely to have been built in the order named and predate the latter occupation of the first half of the 6th century BCE. According to Stronach, the central temple, with its stark design, "provides a notable, if mute, expression of religious belief and practice". A number of ceramics from the Median levels at Tepe Nush-i Jan have been found which are associated with the time (the second half of the 7th century BCE) of the Median consolidation of their power in the Hamadam areas. These findings show four different wares known as ÒCommon wareÓ (buff, cream, or light red in color and with gold or silver mica temper) including jars in various size the largest of which is a form of ribbed pithoi. Smaller and more elaborate vessels were in Ògrey wareÓ, (these display smoothed and burnished surface). The ÒCooking wareÓ and ÒCrumbly wareÓ are also recognized each in single handmade products. The site is located 13 km east of Kangavar city on the left bank of the river Gamas Ab.he excavations, started in 1965, were led by T. C. Young, Jr. which, according to D. Stronach, evidently shows an important Bronze Age construction that was reoccupied sometime before the beginning of the Iron III period. The excavations of Young indicate the remains of a part of a single residence of a local ruler which later became quite substantial. This is similar to those mentioned often in Assyrian sources. Baba Jan (probably the seat of a lesser tribal ruler of Media). The site is located in northeastern Luristan with a distance of roughly 10 km from Nurabad in Lurestan province. The excavations were conducted by C. Goff in 1966-69. The level II of this site probably dates to 7th century BCE. These sources have both similarities (in cultural characteristics) and differences (due to functional differences and diversity among the Median tribes). The architecture of this archaeological findings that can probably be dated to the Median period show a link between the tradition of columned audience halls seen often in Achaemenid Iran (for example in Persepolis) and also in the Safavid Iran (for example in "the hall of forty columns" from 17th century CE) and the Median architecture. The materials found at Tepe Nush-i Jan, Godin Tepe, and other sites located in Media together with the Assyrian reliefs show the existence of urban settlements in Media in the first half of the first millennium BCE which had functioned as centres for production of handicraft and also of an agricultural and cattle-breeding economy of a secondary type. For other historical documentation, the archaeological evidence, though rare, together with cuneiform records by Assyrian make it possible, regardless of Herodotus accounts, to establish some of the early history of Medians. Iranic tribes were present in western and northwestern Iran at least from 12Ð11th century BCE. The significance of Iranian elements in these regions were established from beginning of the second half of the 8th century BCE. By this time the Iranian tribes were the majority in what later become the territory of Median kingdom and also the west of Media proper. A study of textual sources from the region show that in Neo-Assyrian period, the regions of Media and further west and northwest had a population with Iranian speaking people as majority. In western and northwestern Iran and in areas west to these and prior to the Median rule there were previously political activities of powerful societies of Elam, Mannaea, Assyria and Urartu (Armenia). There are various and up-dated opinions on the positions and activities of Iranian tribes in these societies and prior to the "major Iranian state formations" in the 7th century BCE. One opinion (of Herzfeld, et al.) is that the ruling class were "Iranian migrants" but the society was "autochthonous" while another opinion (of Grantovsky, et al.) holds that both the ruling class and basic elements of the population were Iranian. During the period of the Neo Assyrian Empire (911-612 BC) the Medes, Persians and other Iranic peoples of northern and western Iran were subject to Assyria. This changed during the reign of Cyaxares, who in alliance with Nabopolassar of Babylon and the Scythians attacked and destroyed the strife riven empire between 616 and 605 BC. The list of Median rulers and their dates compiled according to A: Herodotus who calls them "kings" and associates them with the same family, and B: Babylonian Chronicle which in "Gadd's Chronicle on the Fall of Nineveh" gives its own list, ist: Deioces (reign 700-647 BCE), Phraortes (reign 647-625 BCE), Scythian (reign 624-597 BCE), Cyaxares (reign 624-585 BCE) and Astyages (reign 585-549 BCE): a total of 150 years. Not all of these dates and personalities given by Herodotus match the other near eastern sources. In Herodotus (book 1, chapters 95-130), Deioces is introduced as the founder of a centralized Median state. He had been known to Median people as "a just and incorruptible man" and when asked by Median people to solve their possible disputes he agreed and put the condition that they make him "king" and build a great city at Ecbatana as the capital of Median state. Judging from the contemporary sources of the region and disregarding the account of Herodotus puts the formation of a unified Median state during the reign of Cyaxares or later. In Greek references to "Median" people there is no clear distinction between the "Persians" and the "Medians"; in fact for a Greek to become "too closely associated with Iranian culture" was "to become medianized, not persianized". The Median kingdom was a short-lived Iranian state and the textual and archaeological sources of that period are rare and little could be known from the Median culture which nevertheless made a "profound, and lasting, contribution to the greater world of Iranian culture". Median people spoke the Median language, which was an Old Iranian language. Strabo in his Geography (finished in the early 1st century AD) mentions the affinity of Median with other Iranian languages: "The name of Ariana is further extended to a part of Persia and of Media, as also to the Bactrians and Sogdians on the north; for these speak approximately the same language, but with slight variations". No original deciphered text is proved to have been written in Median language. It is suggested that similar to later Iranian practice of keeping archives of written documents in Achaemenid Iran, there was also a maintenance of archives by Median government in their capital Ecbatana. There are examples of "Median literature" found in later records. One is according to Herdotus that the Median king Deioces, appearing as a judge, made judgement on causes submitted in writing. There is also a report by Dinon on existence of "Median court poets". Median literature is a part of the "Old Iranian literature" (including also Saka, Old Persian, Avestan) as this Iranian affiliation of them is explicit also in ancient texts, such as Herodotus's account that many peoples including Medes were "universally called Iranian". Words of Median origin appear in various other Iranian dialects, including Old Persian. A feature of Old Persian inscriptions is the large number of words and names from other languages and the Median language takes in this regard a special place for historical reasons. The Median words in Old Persian texts, whose Median origin can be established by "phonetic criteria", appear "more frequently among royal titles and among terms of the chancellery, military, and judicial affairs". 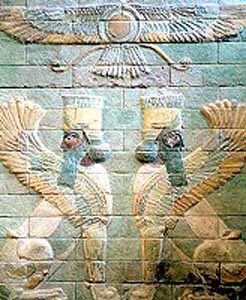 winged disk, from the Palace of Darius at Susa. Now held at The Louvre, Paris. There are very limited sources concerning the religion of Median people. Primary sources pointing to religious affiliations of Medes and found so far include the archaeological discoveries in Tepe Nush-e Jan, personal names of Median individuals, and the Histories of Herodotus. The archaeological source gives the earliest of the temple structures in Iran and the "stepped fire altar" discovered there is linked to the common Indo-Iranian legacy of the "cult of fire". 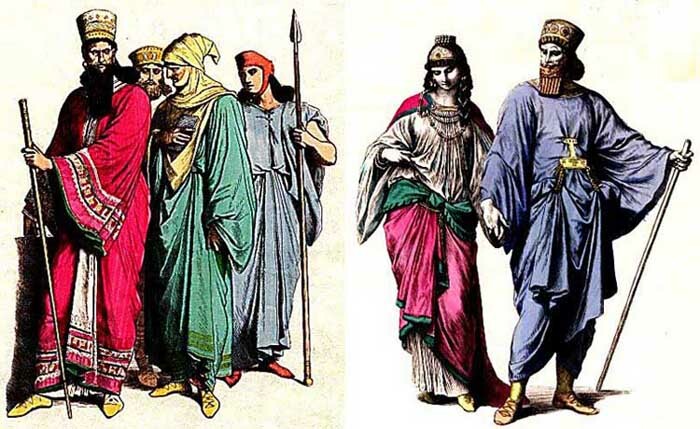 Herodotus mentions Median Magi as a Median tribe providing priests for both the Medes and the Persians. They had a "priestly caste" which passed their functions from father to son. They played a significant role in the court of the Median king Astyages who had in his court certain Medians as "advisers, dream interpreters, and soothsayers". Classical historians "unanimously" regarded the Magi as priests of the Zoroastrian faith. From the personal names of Medes as recorded by Assyrians (in 8th and 9th century BCE) there are examples of use of the Indo-Iranian word arta- (lit. "truth") which is familiar from both Avestan and Old Persian and also examples of theophoric names containing Mazdakku and also the name "Ahura Mazda. Scholars disagree whether these are indications of Zoroastrian religion of Medes. Diakonoff believes that "Astyages and perhaps even Cyaxares had already embraced a religion derived from the teachings of Zoroaster which was not identical with doctrine of Zarathustra and Mary Boyce believes that "the existence of the Magi in Media with their own traditions and forms of worship was an obstacle to Zoroastrian proselytizing there". Boyce wrote that the Zoroastrian traditions in the Median city of Ray probably goes back to 8th century BCE. 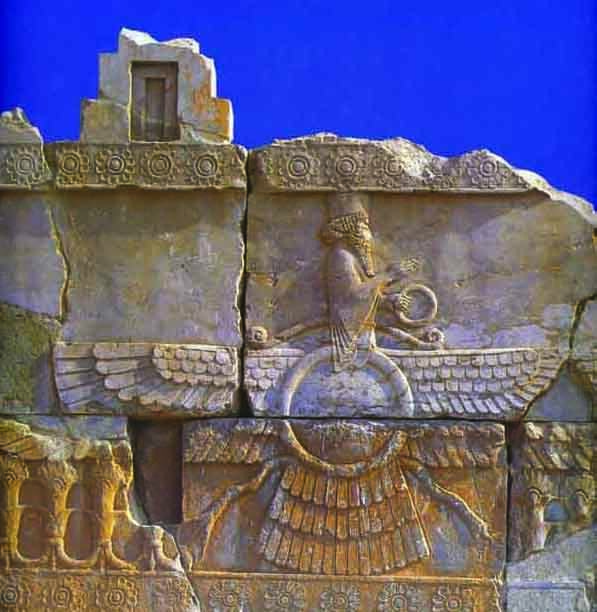 It is suggested that from 8th century BCE, a form of "Mazdaism with common Indo-Iranian traditions" existed in Media and the strict reforms of Zarathustra began to spread in western Iran during the reign of the last Median kings in 6th century BCE. It is also suggested that "Mithra" has a Median name and Medes may have practiced Mithraism and had Mithra as their supreme deity. In 553 BC, Cyrus the Great, King of Persia, rebelled against his grandfather, the Mede King, Astyages son of Cyaxares; he finally won a decisive victory in 550 BC resulting in Astyages' capture by his own dissatisfied nobles, who promptly turned him over to the triumphant Cyrus. 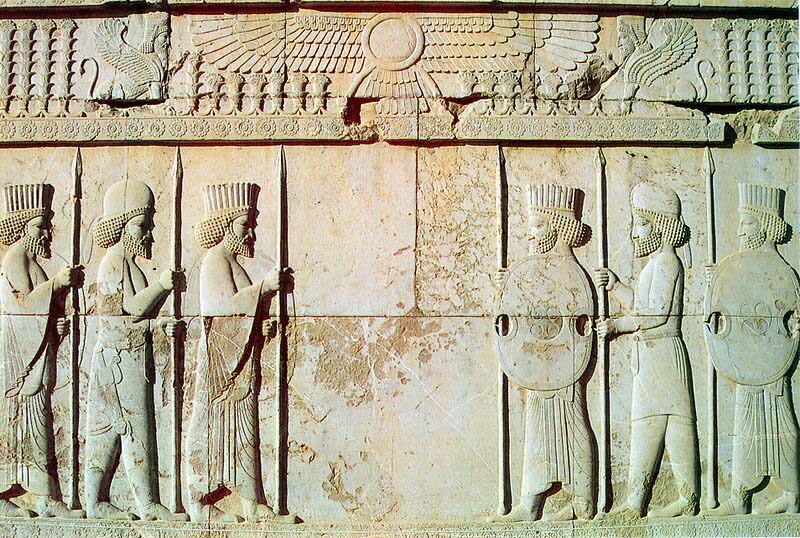 After Cyrus's victory against Astyages, the Medes were subjected to their close kin, the Persians. In the new empire they retained a prominent position; in honor and war, they stood next to the Persians; their court ceremony was adopted by the new sovereigns, who in the summer months resided in Ecbatana; and many noble Medes were employed as officials, satraps and generals. Interestingly, at the beginning the Greek historians referred to the Achaemenid Empire as a Median empire. After the assassination of the usurper Smerdis, a Mede Fravartish (Phraortes), claiming to be a scion of Cyaxares, tried to restore the Mede kingdom, but was defeated by the Persian generals and executed in Ecbatana (Darius I the Great in the Behistun inscription). Another rebellion, in 409 BC, against Darius II was of short duration. But the Iranian tribes to the north, especially the Cadusii, were always troublesome; many abortive expeditions of the later kings against them are mentioned. Modern artistic drawing of "Median" and Persian noblemen. The Russian historian and linguist Vladimir Minorsky suggested that the Medes, who widely inhabited the land where currently the Kurds form the majority, are likely to be the forefathers of the modern Kurds, also on the basis of historical and lingustic evidence that he gathered. M. Chahin and Wadie Jwaideh wrote that "The Medes were the ancestors of Xenophon's Carduchi and the modern Kurds. Contemporary linguistic evidence has challenged the previously held view that the Kurds are descendants of the Medes. Gernot Windfuhr (professor of Iranian Studies) identified Kurdish dialects as Parthian, albeit with a Median substratum. Even though Kurdish is a northwestern iranian language, David Neil MacKenzie, an authority of Kurdish language, thought that the Medes spoke a northwestern Iranian language, while the Kurdish people speak a southwestern Iranian language. The Kurdologist Martin van Bruinessen argues against the attempt to take Medes as ancestors of the Kurds. Modern scholars who consider central Iranian dialects, mainly those of Kashan area, and Tati of Tehran area as the only direct offshoots of the Median language.